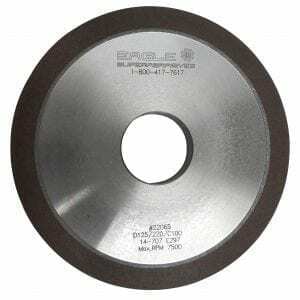 Choosing a grinding wheel that will meet your business needs can be a difficult task. There are many factors that have to be taken into consideration when deciding between CBN Wheels vs Diamond Wheels. The experts at Eagle Superabrasives will provide superior support and advice along the way, making a once difficult task, a breeze. CBN and Diamond are ideal for superabrasives because they are both extremely resistant to wear. Both have fought to hold the spotlight of the grinding industry for many years; each boasting characteristics that may outperform the other. CBN and Diamond Wheels have successfully replaced many machining and stock removal techniques using conventional abrasive wheels. The cost of the wheels may seem daunting at first, if you’re used to working with conventional wheels, however they are very cost effective in high volume production. CBN Wheels are taking the sharpening and grinding world by storm. CBN stands for cubic boron nitride, it’s a man-made material that rivals the hardness of diamond. CBN Wheels are great for grinding hardened steels, where diamond is not. Diamond is composed of pure carbon and is produced under high heat and pressures. When Diamond is used to grind hardened steels it begins to form carbides and loses it strength, meaning that the diamond breaks apart and your grinding wheel is destroyed. So what makes CBN better for working with hardened steels? CBN is not composed of carbon atoms, instead it is formed with boron and nitride under pressure and heat. Grinding hardened steels produces high temperatures, CBN has a great thermal conductivity, keeping it cool under extreme heat. If you would like to read more about CBN Wheels click here. Diamond is widely known as being the hardest material for grinding and sharpening. It is cost effective when working with carbide, glass, ceramics, ferrite and non-ferrous metals. The biggest advantage of using a diamond wheel is its hardness and its high thermal conductivity. The high thermal conductivity, allows the diamond crystals to transfer heat away from the cutting edge of the wheel and dissipate the thermal energy throughout the grinding wheel body into the grinding coolant that is applied. By effectively cooling the cutting area as well as the wheel, a longer wheel life is obtained. Both Diamond Wheels and CBN Wheels are excellent choices for superabrasive wheels. Each wheel contains an advantage over the other, the experts at Eagle Superabrasives will be able to answer any questions regarding which superabrasive will be best for you and the material that you are working with. Contact us today to place an order and be sure to ask about same-day shipping!